Lindsey focuses her practice on the defense of civil litigation, including medical malpractice, nursing home/long term care, workers’ compensation and employment and labor litigation and counseling. She has handled all aspects of litigation including initial assessment, pleading, discovery, motion practice, and trial preparation. Lindsey’s practice is focused on defending physicians, healthcare workers and employers in all aspects of litigation. Lindsey received her bachelor's degree from the University of Illinois – Urbana Champaign in 2008. She is a member of the Illinois State Bar Association and Winnebago County Bar Association. 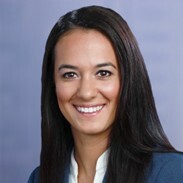 Lindsey is currently serving as President of the Winnebago County Bar Association, Young Lawyers Division. Named to Law Bulletin Publishing Company's list of Illinois Emerging Lawyers (2018). Only two percent of Illinois lawyers under the age of 40 or who have been licensed to practice for 10 years or less earn this distinction.